Today's Magpie of the Month post highlights a piece of jewelry from the Bernadotte collection that Crown Princess Victoria has begun wearing over the past few years: a diamond necklace made in part from a stomacher that belonged to one of her ancestors, Queen Josefina. 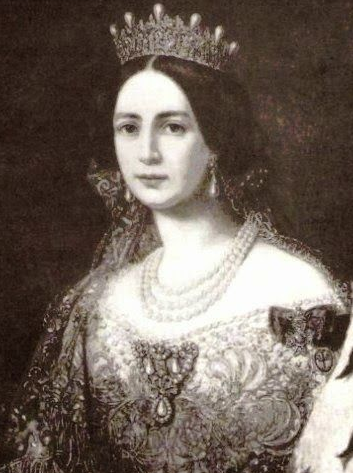 We've talked quite a lot here about precisely how extensive Josephine of Leuchtenberg's jewelry collection was. It's just nuts. She owned the grand diamond tiara now worn by Queen Sonja of Norway, plus the Norwegian royal family's extravagant emerald parure. She owned the sapphire parure and the amethyst parure owned by the Swedish royals. She owned the cameos worn by Crown Princess Victoria on her wedding day (pictured above), plus the Brazilian diamond parure and the Danish ruby parure. And that's barely even scratching the surface! Of all of the grand pieces of nineteenth-century royal jewelry, stomachers are undoubtedly the most difficult to wear with today's clothing. 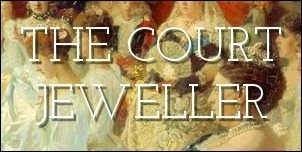 Some of them have been dismantled or broken into pieces; others have been repurposed into new pieces of jewelry, like the tiara that belongs to Queen Anne-Marie of Greece. The Bernadottes have tackled the stomacher problem in this case by transforming it into part of a large diamond necklace. In the process, the pearl drops were removed, and today the piece is all diamonds. The necklace has been worn by many members of the family, but it became a particular favorite of the late Princess Lilian. It was a perfect pairing with the family tiara that she received from her husband, Prince Bertil: Crown Princess Margareta's laurel wreath tiara, made by Boucheron. Lilian often wore the tiara and the necklace together at events like the annual Nobel Prize ceremony. In her will, Lilian bequeathed the laurel wreath tiara to her great-niece, Crown Princess Victoria. At one of the first white-tie events held after Lilian's death, the wedding of Princess Madeleine, Victoria wore her great-aunt's tiara. In an extra tribute to Lilian, she also donned another of her favorite pieces of jewelry: the stomacher necklace. It was a wonderful way to remember the great-aunt who was like a grandmother to Victoria's generation of Swedish royals.